We all know account-based (ABx) strategies are hot. Search for “account-based technology” on Google, and before you know it, targeted display ads will fill your browser, vendor branded socks will arrive in your mailbox, and dozens of new SDR cadences will flood your inbox. No doubt, the technology behind ABx is amazing. But what gets less attention is how the SDR role needs to evolve to support it. I want to share one company’s journey. Meet Zignal Labs. Zignal Labs, Inc. provides a cloud-based platform that analyzes social and digital media in real-time and delivers data-driven insights. By way of orientation, their average deal is six figures and the sales cycles run 6–8 months. Jamie Varley, Director of Account Development at Zignal, shared how his group integrates into the company’s account-based approach. Account selection was step one. Zignal knew that success hinges on their ability to focus. Their theory was that a smaller number of accounts would result in higher quality output. But which accounts were “worthy” of the target account designation? Rather than just draw a line under the largest 50 accounts in their key verticals, Zignal pulled together a cross-functional team to build their list. This included the heads field sales, marketing, sales operations, and sales development. Looking at their current customers, they divided them into a 2x2 matrix. 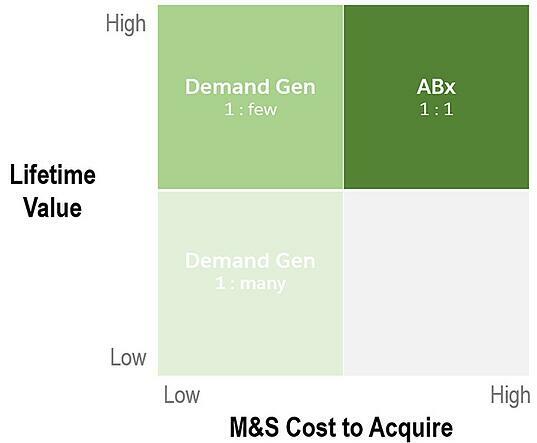 If an account, required significant marketing and sales expense to acquire—but also delivered significant lifetime value—it was placed in the top right quadrant. If an account delivered high value—but was easier to win—they were placed in the top left. And so on. They were able to identify lookalike companies and map them against this framework. Those in the top right quadrant were deemed AB-appropriate, while those in the top left were better suited to traditional demand generation. Next, they moved to mapping out prospect personas. Questions included: what departments are key to our sale? Which departments have the budget for a solution like ours? How can we best leverage internal champions? What content do we have/need that will allow for 1:1 communication with these buyers? Zignal knew: no focus, no content, no personalization, means no ABx. Next, Marketing committed to building a rock-solid content and enablement strategy. They focused on creating both persona-related and industry-related content for the AEs and Account Development Reps (ADRs) to leverage. In a world of reps who’d "love to get 15 minutes on your calendar" and ubiquitous offers to "see a demo," it takes real work, real empathy, and real insight to stand out. At the same time, the ADR team conducted a data “audit and verification.” They ensured that each account had the right contacts identified, populated, and enriched in CRM (e.g., 1+ contact for each of their personas). Rather than rely exclusively on third-party data, ADRs phone-verified each contact’s role. This was an upfront resource investment. But Jamie didn’t want his team conducting account-based outreach with faulty data. When prospecting the mid-market, it’s much easier to swap out contacts as needs dictate. Things gets a lot more complicated when conducting a total account, multi-department, multi-media, and tag team campaign. ADRs were expected to stay hands off these accounts. In this scenario, ADRs target more junior contacts while the AE goes after senior executives. Any intelligence and traction gained are shared and leveraged by both parties. Only ADRs work to crack into these accounts, leaving the AEs to focus elsewhere. Zignal knew: to run successful plays, everyone needs to know their roles and routes. One thing you might be wondering at this point is: how do the ADRs get paid? This a common question and ABx requires a small twist to the norm. Remember, compensation drives behavior. The behavior they were trying to drive was a true partnership between the ADR team and the field. At Zignal, the ADR is rewarded for building a strong relationship with the buyer. ADRs are paid based on a meeting which happens and in which they take part. This is a Sales Qualified Appointment (SQA). For this they get a flat rate for the meeting and another flat rate if it is accepted as an opportunity. This accounts for roughly 40% of their incentive compensation. If that meeting does not immediately convert to an opportunity, the ADR continues to work the account. At the point that it does become a Sales Qualified Opportunity (SQO) the ADR is paid an even higher flat rate. This is to reward the ADR for their effective nurture tactics. This accounts for roughly 60% of their compensation. Finally, if a deal they have sourced/nurtured closes, they receive a portion of the revenue for the first year. This is over and above their target incentive number. Zignal knew: compensation must evolve alongside of strategy. Expect to put in the time- ABx involves a lot of heavy lifting. If you aren't ready or able to make the investment in time, you may need to think about another customer acquisition plan. Over-communicate your goals, plans, and roadmap. People will immediately doubt what you’re doing if they aren't in the know. ABR is a "slow roast"- If you want the best results, you must have and use the best ingredients! Be obsessive about your contact data. This will speed the process of generating actual results. Have relevant content for the industry and the personas you target. Build trust- Today, breaking into strategic accounts with only blunt instruments is an exercise in futility. Leverage every tool at your disposal to build trust and engage with your key accounts. Whitepapers, eBooks, webcasts, blogs, regional events, and annual customer conferences are all good reasons to engage, build trust, and accelerate a buy-cycle. Reporting has to be on point- Visibility across all teams is key in helping people see the fruits of your labor. You can’t wait 2-3 quarters before seeing if things are “working.” Figure out the leading indicators and measure them from day one. At the same time, traditional funnel metrics are no longer relevant in an ABx world -- so you will need to recalibrate your executive and sales management team. For example, top-of-the funnel MQL metrics should be replaced with engagement metrics. Be prepared to navigate lots of challenges and even some failures- Nobody has ever taken down the big game without getting a few bruises along the way. So, what do you think? Ask your questions here and Jamie will answer them. There is so much to learn as companies shift sales development upstream, so let’s share that journey.